The compact crossover segment is the fastest growing in the automotive market, and it’s no wonder why: Consumers want vehicles that combine the fuel economy and driving dynamics of a sedan with the higher ride height and larger passenger space of a SUV. Cadillac’s XT4, the newest addition to their crossover XT lineup, fits neatly into this category. It still has size, at 181 inches long and 63 inches high, with an ample, yet compact 109-inch wheelbase. And although it seems to defy reason, it has essentially the same interior space as its larger sibling the XT5, plus two more inches of headroom. The XT4 leads the compact SUV class with the most second-row legroom, so your passengers will enjoy that extra space, measuring 39.5 inches in the rear seats versus 40.4 in the front — almost identical numbers. Cargo space measures 22.5 cubic feet with the 60/40 split rear seats folded up, and 48.9 cubic feet with them folded down. Cadillac has historically been an innovator, introducing the first electric starter, the first thermostat-controlled heating and air conditioning system, the first GPS for customer assistance, and the first blind-spot detection technology. The XT4 proves that the innovations haven’t ended there, with an industry-first rear camera mirror and 360 camera with changing views. The Cadillac User Experience system is the command center of the vehicle, with an 8-inch high-resolution touchscreen, configured very similarly to tablet devices for instant familiarity. It is super responsive, with pinch-to-zoom functionality that is instantaneous — especially useful when navigating maps. If you prefer a more manual experience, there are four other ways to operate the interface. You can command it with two rows of instrument panel buttons beneath the screen, by an intuitive rotary controller on the console, or by voice control and buttons on the steering wheel. Cadillac describes the XT4 as a “more spirited driving experience,” and it lives up to that, and then some. The 2.0-liter, turbo-charged engine is newly designed for maximum efficiency without sacrificing power. If you’re skeptical about a 2.0-liter engine, “turbo-charged” are the operative words here. It has 237 horsepower, and 258 lb-ft of torque that kicks in at 1,500 rpm, so when you put your foot down on the accelerator, it responds with noticeable power and no hesitation. The engine is paired with a 9-speed automatic transmission and available dual-clutch, all-wheel drive system. The gear shifter is simple to operate, providing straight up-and-down gear selection. To shift, you just depress the button the left side and shift up or down to select a gear. Selectable driving modes allow you to customize your trip, and the ability to switch from front-wheel to all-wheel drive without having to stop the vehicle is very convenient. Fuel efficiency in all-wheel drive (29 mpg) is almost the same as in front-wheel drive (30 mpg) on the highway. Overall, the ride is smooth and balanced, quiet and comfortable, with dynamic handling and great visibility. As for appearance, the XT4 is available in Luxury, Premium Luxury and Sport models. The Premium Luxury model provided for this review had an exterior accentuated by a metallic-accented and chrome-finish grille, sleek satin-aluminum roof rails and side-window moldings, with illuminating door handles. All models feature signature light-blade LED head and tail lamps that create a striking profile. With regard to safety, the XT4 has available driver-assistance features galore. Especially impressive is the high-definition rear camera that feeds into the rearview mirror — so your view will no longer be blocked by tall passengers or cargo. The video feed has ultra-clear resolution with no time lag. For parallel parking, optional side cameras allow you to see a side view of the wheels so you know how close to the curb you are. Another cool option is HD Surround Vision that provides an overhead ‘drone-like footage’ view of the vehicle’s exterior via cameras on the front, back and sides creating a composite view. The vehicle is equipped with sensors that determine its relative distance to surrounding objects, enabling available features like: Forward and Reverse Automatic Braking to prevent potential collisions; Rear Cross Traffic Alert to warn you of oncoming traffic when backing out; and Lane Keep Assist that gently nudges your steering wheel if it detects you’re drifting out of a lane unintentionally. Other available features for convenience and comfort include heated front and rear seats, massaging front seats, as well as a projected LED Cadillac logo underneath the left rear fascia that opens the tailgate/rear hatch with the swipe of your foot if your hands are full. With a hip commercial that features “Bang Bang,” by Jessie J, Ariana Grande and Nicki Minaj, the XT4 is not-so-subtly targeting the “established millennial” demographic, but there’s something here for everyone. In fact, at Red Noland they’re seeing more mature consumers getting out of sedans and into crossovers because of the favorable entry height for seating, and their added performance in Colorado road conditions. In a clever design move, the grille shape mimics the venerable shield from the brand logo. Cadillac traditions are also echoed by the “V” emblem that appears on the seats — a throwback to the 1957 logo. But that’s where the throwbacks end. Cadillac remain innovators both in style and features, and with the XT4 they’ve introduced a very worthy contender in a hotly contested class. 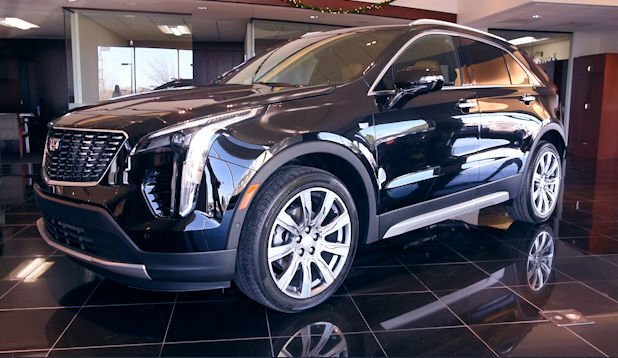 For more information, stop by Red Noland Cadillac at 990 Motor City Drive, call them at 719-633-4633 or visit rednolandcadillac.com.